The plastic bottle bird feeder is an attempt to encourage people to repurpose old plastic soda bottles and at the same time to promote the feeding of wild birds. The kit contains everything you need except for a clean old soda bottle and some bird seeds or nectar. You’ll have fun assembling it and later watching wild birds as they come to feed in your yard. Soda bottles and bird food are not included. The set is not intended to be used with glass bottles, but only with big soda bottles. You should add several holes for rain drainage at the bottom of the unit. I personally drilled four additional holes on the bottom of the sides of the feeder. Make the holes the same size as the preexisting drain holes on the unit. The holes will provide sufficient water drainage so that the seeds inside are safe from rot or mildew. The product is intended for use with typical two liter soda bottles. All two liter soda bottles I have seen have a security ring made out of plastic a little below the cap. You have to remove that ring before screwing the bottle into the feeder, otherwise it will not fit. Take care not to cut the bottle plastic itself when you remove the ring. Best use a sharp utility knife and cut the ring until it breaks apart. The original design displays the feeder mounted on a vertical surface, but I don’t recommend that because that position leaves the feeder vulnerable to squirrel raids. The feeder should definitely be hung, at least 5’ above ground and distant from side structures. That will prevent squirrels from reaching the feeder and stealing the seeds inside. When hanging this feeder, you can either use the hanger which comes in the set or you can manufacture your own version. Start by drilling 2 holes (9/64") near the bottom of the bottle on opposite sides (if drilling is not your thing, you can also use a heated nail to melt a hole in the plastic). The holes should be large enough to pass the wire through and not larger. When you have made the holes, take the ends of the wire hanger you received in the set and push the ends into the holes. And that’s it. You now have a sturdy hanger to hang your soda bottle feeder. The only negative aspect I have found is the fact that the opening gets easily clogged by too much rain or snow. In order to minimize the chance of that happening, you should place the feeder under some protection. In order to keep squirrels from accessing your bird feeder, you should place a squirrel baffle on the hanger. In case a squirrel tries to reach the feeder, the baffle will give way under the animal’s weight and the squirrel will fall off. Squirrels can’t figure out how to get around this obstacle so they give up. Depending on the frequency of your feeding, you can use two soda bottles – so one of them can be in use, and the other one is filled with seeds and ready to replace the first one when it empties. This feeder is actually great except for the fact that it can cater only to two birds at a time, which causes a lot of fighting between the birds. Besides that, the feeder is well constructed and great. The contents of the feeder stay clean and all the water drains easily. This feeder can withstand years of use so they are really great value for your money. 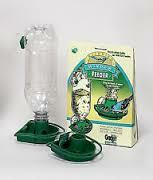 You can use both the two liter soda bottles and the smaller 24 ounce bottles sold in six packs with this feeder. This is just one more use the bottles can have before you send them off to be recycled. One drawback, although minor, is that the feeder is constructed to fit on a soda bottle screw top which was manufactured a decade ago, and today’s bottles are being made with a smaller screw top. Even so, most bottles fit ok, and some will fit as it was intended, especially the tall bottles recommended by the manufacturer. First, you should thoroughly clean and dry your bottle, as well as remove all labels. It’s best to leave it to dry overnight, so no moisture will remain that could cause the seeds to spoil. Then, just screw the base onto the bottle and that is it. The assembly is incredibly simple. This is a really well made item which is easily assembled by screwing it onto a bottle. However, it can be a bit complicated to refill because the bottle hole is so small that you have to refill it very slowly. If the bottles get damaged or distorted, you can always replace them with new ones, and the base (which is in the item set) is so sturdy that it will last you forever. The metal construction makes all the difference in the sense of durability. It is a really well built item and ours has endured squirrel attacks, falls and abuse from birds, regular cleaning and bad weather. The fitting system is really simple, and the bottles need no adjustment. I usually make two openings with a precise knife into which I insert the hanger. When the bottle is old or gets damaged, we just replace it with a new one. Birds simply adore it. One thing to look out for is that the wind will blow the bottle down if it is empty. This is definitely the top low price choice on the market. It’s very simple to use and a true bird favorite. Remember how most bird feeders get to dirty to clean after prolonged use? With this feeder, you just need to replace the soda bottle, and the feeder is like new again. I purchased two of these feeders for my garden and keep different seeds in them so I can enjoy all the various bird species. Installing the soda bottle bird feeder is a simple and quick project which effectively combines recycling and bird care. At the same time, these feeders are completely functional and can allow garden birders to feed more birds without the need for great expenses. Rather than pilling up plastic waste at the landfill, use your plastic bottles and construct a functional bird feeder. 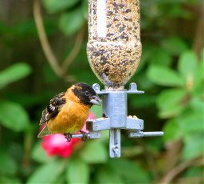 This is a great product which allows you to make your own feeders. The bottle feeders are inexpensive and a great way to enjoy birds and save money at the same time. Check Channel Craft - Soda Bottle Bird Feeder here. This is a nother type of Soda bottle Bird Feeder, but this one can be installed on the window. These feeders are simple, elegant and amazingly reasonably priced. 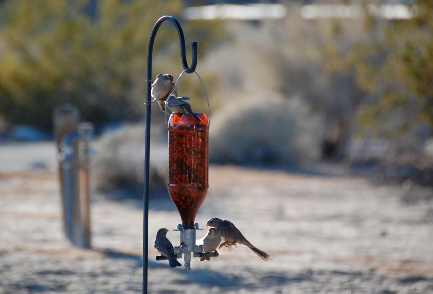 Assembly, filling and mounting the feeders is easy and takes about one minutes. Place it and wait for a few days t see if the birds will find it, you can put sam seeds under the feeder to, that will attract the birds. The suction cups are well made and stabile (if mounted as instructed) and feature a side tab which allows them to be easily moved, without the need to pry them from the glass with your fingernails. I have seen the soda bottle bird feeders stand firm in strong wind, but it did not move the feeders. However, feeders have to be places on a secure spot where thay ar not exposed to storms, and i recommend this. Mounting the suction cups on the top part of the bottle requires drilling a hole in the plastic side of the bottle. I would advise that this be done by an adult person. The funnels that come in the set are nothing fancy. I usually make a larger hole at the bottom because the large sunflower seeds tend to clog the existing one. There is no template on how to mount the feeder, but you’ll need both free hands to do it. I usually measure the distance between the cups, make two dots on the inside of the window glass with a marker and then mount the cups on the outside, on the marked spots, and slide the feeder onto them. This feeder is not squirrel proff as is made all of plastic, but its one of the less expensive ones on the market. Check Window Soda Bottle Wild Bird Feeders - 2 pack MADE IN USA here.